As you may have noticed, Eljae are quite taken with the TV show Noel Fielding’s Luxury Comedy. Jae watches it on a Thursday night, partly for the LOLs and partly to see if it is suitable for 12 year old El to watch after school on Friday. Some of them have been a bit too sweary,and so far El has only been able to watch episodes 2 and 5.
b) should El be allowed to watch? Tonight’s episode is called Tiger With Chlamydia, so really it could go either way on the family-friendly front. Last week there was no Dolly or Andy Warhol, so hoping for double action from them this week. 10pm We’re off! And there’s a reference to testicle shaving in the first minute. But I think we can let that go. It’s a 12 rating we’re after, not PG. 10:01pm Double Andy Warhol, yes! Just call me Mystic Meg. 10:02pm Plasticine Joey Ramone with faux Ivor Cutler voice over. Marvellous! Though not as good as The Ramones or real Ivor Cutler, but in the absence of both of them it’ll do. 10:05pm I’m not that keen on Sgt Boombox, the US cop with the talking arm wound, but El likes him. I think it’s because he’s yellow like The Simpsons. 10:09pm oo, the Lion, we like him. And a new character, Allen Key. He’s got potential. 10:11pm aw, poor Dondylion. El will weep at that. And first sighting of the F word! At this rate El won’t be seeing this episode, but on the good side at least she be spared being traumatised by the lion’s fate. 10:16pm So if I show this to my child, there’s no avoiding the What is chlamydia? conversation. Hmm. That’s not something I expected to have to think about …erm…ever, in fact. 10:18pm Thankfully Diamondback and his flamingo have lifted the mood. But where is Dolly? 10:20pm oops, b-grade swear word, or a rude word for poo as it’s known in our house. 10:23pm The MF word in the last few minutes! My child, I fear you won’t be seeing this one. Still, you can always read the live blog. 10:26pm Yay, Dolly! She’s the best thing on this. a) is it any good? Sometimes, and if somebody stitches together all the best bits on Youtube that will be a CRACKER. b) will I let El watch it? I’ll sleep on it, but at the moment the intermittent swearing and references to foof-diseases is steering me towards a no. Which is a shame, because there’s a lot for kids to love here. What do you think? Vote in the comments box! March 1, 2012. Tags: live blog, luxury comedy, noel fielding. Reviews, Stuff we love. 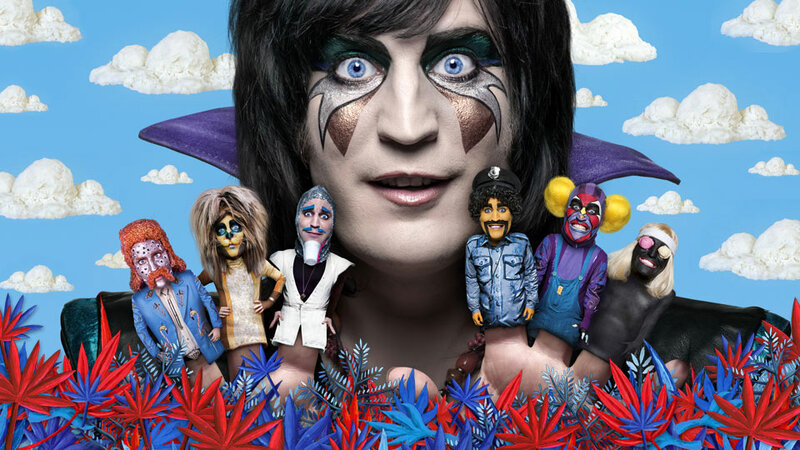 I love Noel and enjoyed The Mighty Boosh, which is quite surreal and has proper story lines- but doesn’t work as well on radio as on telly. I also think he’s brilliant on Buzzcocks. I have been watching his Luxury Comedy from the first episode and like it. No it isn’t laugh out loud funny, but I like the surrealism of it and some of his characters are really great like the copper and his speaking wound and the depressed lion. Also liked the episode when the Andy Warhol character was dressed as Frida Kahlo. March 1, 2012 at 10:02 pm. Permalink. I am not sure I would let a 12 year old watch it either- although it depends on the individual child I would think. March 1, 2012 at 10:39 pm. Permalink. March 1, 2012 at 10:46 pm. Permalink. March 2, 2012 at 9:28 am. Permalink.